You are here: Home / Tennis Psychology / Tennis Confidence / Does Your Confidence Go Up And Down In Tennis? Does Your Confidence Go Up And Down In Tennis? Are you a confident tennis player? That’s a loaded question! You cannot answer with a simple yes or no. Confidence is not a destination. If you win a big match, you don’t achieve eternal confidence from that point forth. Nor is it you lose a tough match, you are totally devoid of confidence and need to go on an epic search to recover it. You end up playing poorly for a stretch of time and find it difficult to bounce back to your previous level of play. Confidence is a long-term process that requires its due diligence for development and refinement. There are varying degrees of confidence and just because you are not supremely 100 percent confident, doesn’t mean you will play poorly. You are able to learn from the experience and rebound for your next match without suffering a huge hit to your confidence level. Caroline Garcia is a 20 year-old French professional tennis player. Garcia burst onto the tennis scene at the 2011 French Open when she took Maria Sharapova to the limit in the second round, 6-4, 4-6, 0-6. Garcia appeared confident and poised to quickly ascend to the top of the tennis rankings. Garcia experienced a tough stretch from September 2013 to February 2014 enduring an eight-match losing streak. Despite those losses, Garcia’s confidence remained stable as she rebounded and to an 18-6 record since that slump. At the 2014 Sony Open, Garcia was the only player to take a set from Serena Williams. Focus on your strengths and play your game accordingly. When you focus on your opponents strengths, you lose your edge. Be patient. Focus on one point at a time no matter if you have the lead or are trailing in a set. You can’t get back into a set with one shot. “Keep it simple!” Don’t over-think or evaluate your play while playing. Trust in your abilities and what got you to this point. 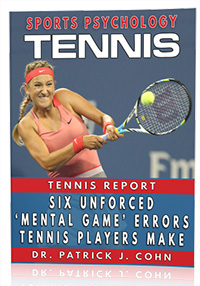 Successful tennis players have learned how to perform with ultimate confidence in tournaments. 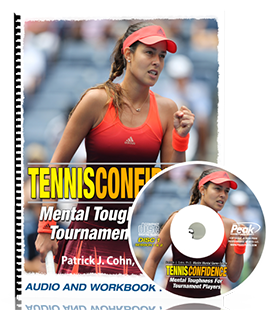 We’ve developed Tennis Confidence: Mental Toughness For Tournament Players to help you do this.